Farmers Insurance entry titled "Salute to the Bands"
DECEMBER 17, 2009  If marching band fans ever needed a reason to set an alarm clock on New Year's Day, this is it. The first float appearing in the 2010 Pasadena Tournament of Roses Parade will be an entry honoring marching bands. Titled "Salute to the Bands," the float from Farmers Insurance Group of Companies features a 60-foot tall animated bugler dressed in marching band attire. The colorful float will be surrounded by the "Farmers Insurance Band"  members of the Riverside Community College Marching Band who will also perform as part of the televised opening ceremony. The 2010 Rose Parade will be broadcast on ABC, Hallmark Channel, HGTV, KTLA, NBC, RFD-TV, Travel Channel and Univision. Live coverage begins at 8:00 AM (Pacific) on Friday, January 1. The Salute to the Bands float will be a very public statement about Farmers' enthusiasm for Rose Parade bands, and the design team is working hard to make it spectacular. Tournament of Roses float designers have become masters at selecting natural materials to create the textures and colors to bring the floats to life. Rose Parade rules require that all visible elements of the floats be covered with natural materials. 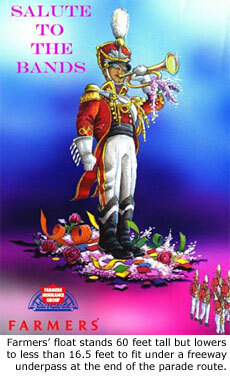 On Salute to the Bands, the vibrant red jacket of the band uniform will be covered with whole red carnations. The uniform trim will be created by yellow strawflower and gold clover seed. The brass bugle will be accented by clover seed, everlasting, flax seed, silverleaf, ground lentil and blue statice. A variety of materials will be used on the base of the float to create floral depictions of streamers, confetti bits and bright red roses. Six people will be riding on the float, including the Farmers Agent of the Year, District Manager of the Year and four top Farmers fundraisers for the March of Dimes. The float was designed and built by Phoenix Decorating Co. of Pasadena. Phoenix Decorating is the largest builder of Rose Parade floats and is supplying 19 floats for the 2010 parade. Salute to the Bands stands 60 feet tall but lowers to less than 16.5 feet in order to fit beneath a freeway underpass near the end of the parade route. As the first float in the 2010 Rose Parade, Salute to the Bands will be part of the showy opening moments of the television broadcast. Confetti will erupt from cannons at the base of the float to enliven the presentation and celebrate the start of the Rose Parade. The 121st Pasadena Tournament of Roses Parade themed 2010: A Cut Above The Rest will take place Friday, January 1, 2010, at 8:00 AM (Pacific) featuring majestic floral floats, high-stepping equestrian units and spirited marching bands. Following the Rose Parade, the 96th Rose Bowl Game presented by Citi will kick off at 2:10 PM and feature an exciting match-up between the No. 8 BCS-ranked Ohio State Buckeyes and the No. 7 BCS-ranked Oregon Ducks. Source material courtesy of Farmers Insurance Group of Companies.